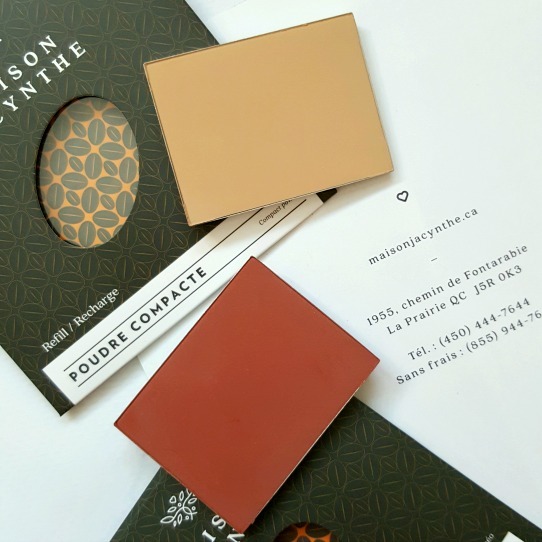 I was contacted last month to review some products from Maison Jacynthe - it is a 100% natural skincare line founded by Jacynthe René who is an actress and producer. She has an online magazine (www.jmagazine.ca) and has published three books in the last 4 years. Jacynthe has been featured in Women’s Health, Clin D’oeil, LaPresse, etc. Nearly 60,000 people in Quebec turn to Jacynthe and her team of experts for advice on health, detox diet, and natural beauty. Last year, Maison Jacynthe joined PETA’s Beauty Without Bunnies Program as one of their cruelty-free companies. Also, Jacynthe's latest book Délices Détox became best seller after being on the shelves for a few days only. In addition to make-up products, she also has a range of skincare products that is free of chemicals, petroleum by-products, preservatives and synthetic fragrances. They strongly believe in using active ingredients and any products with fragrance is derived from plants and flowers. Their products are cruelty-free and eco-friendly. The powders are both very pigmented and finely milled. They are soft and buttery to the touch and definitely packs a punch upon application. I like to use a large fluffy foundation brush to apply the powder foundation to my skin to deliver an even coverage. For the blush, because it is so pigmented, I take a duo fiber brush and literally lightly tap on the product and it's enough to cover both cheeks and deliver a nice flush of color. 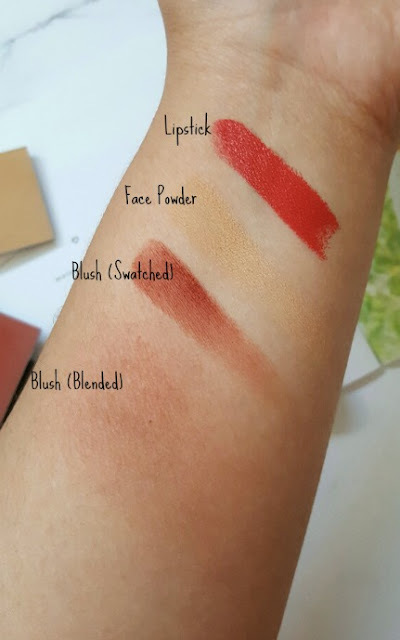 In addition to the swatches on the right, I wanted to share with you some interesting information regarding the products, especially the ingredients as they all sound so utterly divine. The Face Powder is formulated with coffee extracts, babassu butter, macadamia and apricot oils. 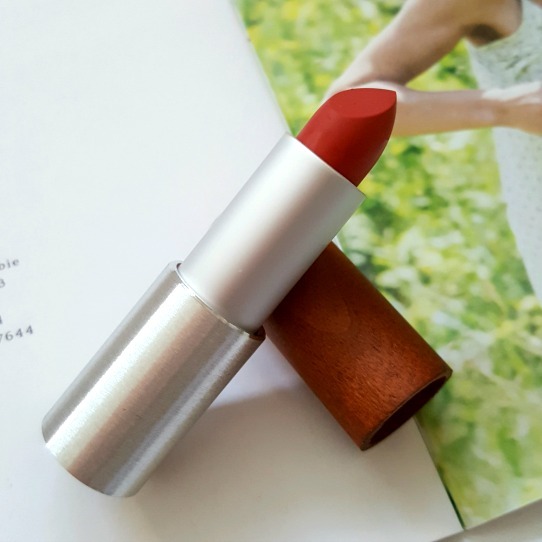 The Blush is formulated with coffee extracts, corn, macadamia and apricot oils and the lipstick is formulated with candelilla wax to provide a smooth application without drying the lips. It contains abyssinian oil to enhance the color and give you a long-lasting effect. I appreciate the way they want to reduce the amount of packing used to produce these products. Instead of housing the products in plastic cases, they come in paper packages with a cardboard sleeve that houses the product. 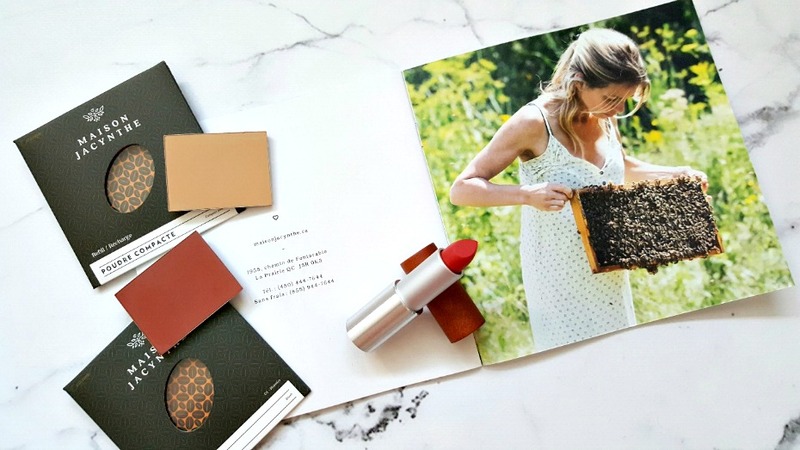 You then can either purchase an empty big palette from their website to house your products, or you can plop them into a Z-palette to make your very own customized palette. I thought that this product would be way too dark on me but as you can see in the pictures below, as well as in the swatched product it blends out very nicely to give you a really beautiful wash of terracotta toned hue, perfect for fall. Finely milled and delivers a sheer to medium coverage without looking cakey. Can't ask for more. It leaves behind a smooth satin touch to the skin. It also has a very light scent to it, nothing offensive or too perfumey but if you are truly sensitive to scents just be forewarned. This is my favorite product that was sent to me for review. 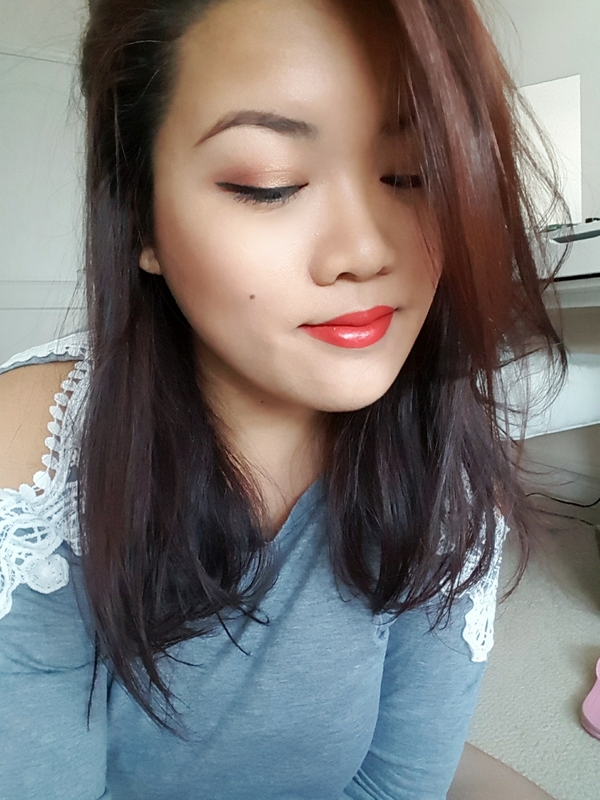 It is a gorgeous coral toned red and really glides on effortlessly on the lips. The pictures below is only with one swatch and it lasted me several hours. Again, this product does have a light scent to it that took about an hour to fade away. However I just love this color so much, its a perfect any season/time shade! I am actually really interested to try out some of their skincare products in the future as their make-up line has impressed me a lot - but until then....as always, XOXO - M.